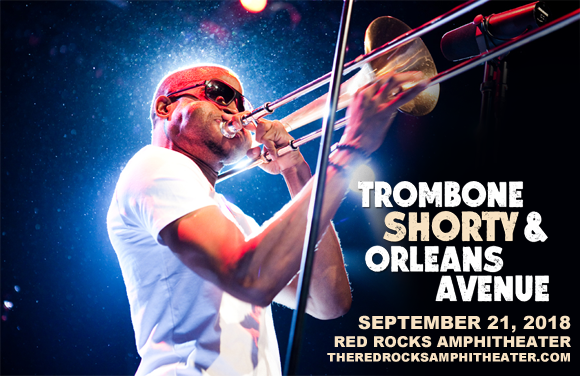 Trombone Shorty and Orleans Avenue are headed to Red Rocks Amphitheater on Friday 21st September 2018 and it's gonna be jazzy! The world-class singer, songwriter and horn-blower will be raising the proverbial roof with his funk and hiphop-influenced grooves, showing his talent as a master of all things brass, backed by his incredible band! Get ready to get down! American musician, producer and actor Trombone Shorty hails from New Orleans, Louisiana and began to play music at a very young age. Aged 4, Shorty appeared on stage with Bo Diddley at the New Orleans Jazz & Heritage Festival, and by age 6 he was playing professionally. 2002 saw the release of his debut album, Swingin' Gate, which received critical acclaim from the jazz world. Two studio albums and four live albums followed, with moderate success, but it was 2010's Backatown that really put shorty on the map. The album debuted at number one on Billboard magazine's Contemporary Jazz Chart, staying there for nine consecutive weeks and in the chart's Top Ten for over six months, and was nominated for a Grammy Award in the Best Contemporary Jazz Album category. February 2017 saw Shorty signing with Blue Note Records, with whom he released his 7th studio album, Parking Lot Symphony, later that year.